Excuse my absence, but Becca and I will be AWOL for Today and Tomorrow as our small county seat community of 4,000 is having their Citywide Garage Sales. Getting Becca inside after her long winter of being quaranteed is virtually impossible. But with the upcoming Swine Flu Scare, for us it will mean Becca will be back quaranteed in the house for several weeks. Wisconsin has its first cases and we will take advantage of being out in the in-out Sunshine digging for bargains. My score this morning....unbelievable.... A Thomas the Tank Train Table, 15 Engines, Track and 6 Buildings...for $50.00. Becca is beaconing, we had just stopped home to change into cooler clothes, letting the puppies out and she is READY to move again. The sales are supposed to open tomorrow at Noon, but with the sun out they are popping up all over town. 100+ sales. Becca is ready to go AGAIN. This morning I woke up and told myself that I was not going to mention to anyone that today is my birthday. I was not sure I wan't to face another year older and didn't want to be any wiser. God as had big plans for me much bigger than I ever thought myself capable of. I was going to ignore my birthday but also testing to see if any of this tribe of mine would remember their mother. Becca popped up out of bed running to the family room where I was busy writing my Target deals when she threw her arms around my neck and yelled in my ear "Happy Birthday Mom" and planting a kiss on my check telling me she Loves Me. That was the best birthday present in the whole world. I told Becca my plan that I was not going to remind anyone that today was my birthday and then Doc pipes up from the next room, he remembered. He and I had been up for 2 hours and he had not said anything? I asked Becca if I was cooking today? She said she would but of course she needs help her hands don't work well, and then told her father "HE WAS HELPING, because he FORGOT". Gift #2 I don't have to COOK! My phone began ringing with a combination of parents who I mentor and support Wishing Me Happy Birthday and then we problem solve or listen while they vent all while trying to help their children with complex needs. Gift #3 I have great friends who are parents who were together parent of extraordinary children with complex challenges. The phone rang again, this time Kristy wishing me Happy Birthday. We talked about how tough and rewarding the job of being a MOM is and I thanked her for being the amazing person she is and my 30 years of parenting had raised an amazing capable thoughtful daughter. My doorbell rang and my dog tribe went nuts when the Orkin Man came and we spent the next hour talking and problem solving this troubles with his adopted daughter. No sooner than he left the phone rang again... This time Marissa was on the phone wishing me a Happy Birthday. I told her my plan that I wasn't going to tip anyone off about my birthday and I was just going to see if anyone remembered. She told me the "Yurcek Birthday Warning System" will not let that happen. They call each other to remind everyone that it is someones birthday so no one would be forgotten. Gift #5 Thoughtful children who care about each other. For some adopted children from the system, they for awhile have to follow the footsteps traveled by their biological parents. A couple of my adopted children strayed from the values we taught them, we tried to protect them from the gutters, but the gutters beaconed them and they had to walk their walk. In the past couple of weeks the last two have turned to family for support and love and told me they love me. Gift #6 All my children are doing as well as they can and know that this family is in their heart. 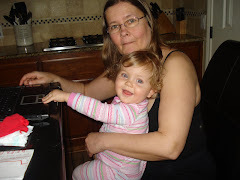 I was looking at my blog and found birthday wishes from my daughter-in-law Stacey. We share our love of bargain hunting and she is completely amazing with being Becca's best friend and sharing her sisters with Becca to easing Becca's lonliness. Shortly thereafter Marissa's soon to be husband called wishing me a Happy Birthday and I wished him one back as his and his Mom's birthday were yesterday. Jordan and I talked writing, he is a writer etc. in the film industry and had done a internship writing for NCIS. We talked today that it was time to find a literary manager and take Tiny Titan mainstream. I told him that this is a HUGE step and I am "just a Mom". Gift #7 amazing individuals who have come into our family. My phone has been ringing off the hook, friends have been calling and singing Happy Birthday. Movie Points from Disney Movie Rewards. I was able to advocate for one of my adult special needs children to get more help. Prayers were answered. I had planned on spending my Birthday Cleaning my house but today I spend my day on the phone, the phone keeps ringing, one call clicked over to another. Gift #8 I have free meals coming up, a few more nights of no cooking and we now have enough movie points to get a free movie as a family. I finally at 3:00 had time to take my meds. I hadn't even had a chance for a shower, my allergy and asthma medication, my iron, my arthritis medication. But I didn't seem to need it until now. Gift #9 I have my health, I have chronic health issues, but they are manageable. As I look back on my day of writing this ongoing post, I had asked myself, "What are birthdays for?" They are a reminder of how old we are, or for me today... a day of reflection over the last 51 years, a day to look at my blessings, my accomplishments, and to Thank God for another year full of gifts and challenges. I thank God for the challenges, as it is out those challenges that I can say... I survived, I grew, I learned to live one day at a time, and I can say at 51 I like who I have become. I am truly blessed, Today I am 51. I have the most incredible husband and family, the most incredible job in the world, the most amazing friends, and am so humbled by the gifts that God has given me. I had grand plans to stay home and get my house in order when my coupon friend Melissa had a day off from Walgreens and wanted to run out and snag a few bargains. Well I had stayed home all week until Friday because of TAX day and lack of funds. My state refund arrived and I couldn't resist the temptation. I bought 4 Quaker Bars, 4 Baby Body Wash, 4 Oscar Mayer Chicken Lunch Meat, 2 Kraft Mac Cheese, 3 Crystal Light, 4 Miracle Whip, 4 Juicy Juice Brain Development for $26.00. Saving nearly $70.00. I went into Walgreens and picked up more Non-Prescription Products this time scoring Aleve and 2 more Advil Children's Motrin for Kasja who has outgrown her baby infant drops paying $.79 after the $1.00 off coupon for each botte. I found Two more Blood Glucose Meters for donation to the Free Clinic that Doc supports and scored 2--$5.00 Rapid Rewards for my shopping. A win--win for both of us. Everywhere was out of the Nivea Body Wash but the good news it is on sale for the month with the Rapid Reward. I managed to get 4 pairs of Women's spring weight sleep pants for $1.74 each, with using a $5.00 RR paid $1.96 plus tax for all four pairs. Detamara is shocked that clothes now come even from Walgreens for nearly free. She then informed me "Do they have underwear? I need some!" Note: Different Walmarts may have different prices depending on location etc. I love Target and with the coupon match-ups from Attention Target Shoppers I can both save time researching and money. Head on over and use this amazing resource. To print the Target Coupons head on over to the Hot Coupon World and use their Target Coupon Generator. 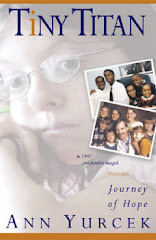 Mothers Day is fast approaching and in honor of Mothers everywhere, I am giving away 13 signed copies of my Mom's Choice Award Winning--Best Adult Non-Fiction autobiography, Tiny Titan, Journey of Hope. (One copy for Yurcek in the book). 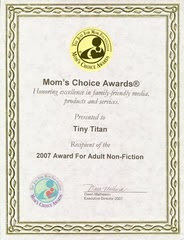 These copies will be signed by both Becca and myself and displaying the Gold Seal of the Mom's Choice Award. Enter by visiting the Tiny Titan website and coming back and listing one thing you learned about the Tiny Titan or the Yurcek Family and tell me how many children you have. Contest will be drawn randomly and ends on May 3, 2009 at 12:00 noon Central Time. 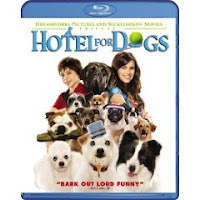 Win a DVD copy of Hotel Dogs from Becca's Movie Giveaway. Leave a comment and let Becca know if you have a dog. (It is not a requirement to have a furry best friend). Blog about this giveaway or the Hotel Dogs Movie Deal and get an extra entry. Winner will be drawn on Sunday May 3 at Noon Central Time. Becca has been anxiously awaiting the release of this weeks Becca's Best Deal Movie Pick. Why? Becca loves dogs and movies. Somehow she has turned our home into our own Doggie Hotel with her Bischon Milo and her teeny-tiny service dog Morgan (a Morkie--Yorkshire Terrier and Maltese). We had our family dog Bailey, a Shitzu-Bischon and Detamaras old rescued Golden Retreiver and Yellow Lab. Tuesday Hotel Dogs will hit the stores. ** The May 4 issue of People Magazine on page 39 has a $3.00 manufacturer coupon. So far there is not a rebate announced as of yet. We will post it if one becomes available. Make sure you stop by and Enter Becca's Giveaway to Win a DVD Copy of Hotel Dogs. We stopped at Walgreens to pick up a prescription and stumbled on Non-Prescription items marked down dramatically. With adding coupons from my binder we were able to stock up on Motril, Advil, Excedrin, Tylenol, Aleve, Walgreens brand products along with Centrum Vitamins for $3 to $4 each less my $2 or $3 coupons for under $35.00 for $300+ worth of merchandise. I paid less than a $1 for most of the name-brand items, and only $2 + for the big 150 to 225 count bottles of Aleve or Tylenol Arthritis. After my friend Melissa helped me find more coupons, I paid a $.25 for 5 bottles of Excedrin Gel Caps after using 5-$1.00 coupons. Why so much,I can't pass up these prices and we will disperse them to my kids homes, our parents, my friends etc. and as always we can donate them. *These items are also eligible for Flex spending account reimbursement. I found one last coupon and picked up one more Excedrin for only 4 pennies. We stopped by Target for a quick run in and out for Viva Paper Towels (they are gluten free) I picked up 2 @ $13.00 for the 10 Big Roll Bonus Pack--used $1.00 + $.40 mfg. coupons and got my $5.00 gift card. (These are 3M products, Kristy and Chris work for 3M and Becca say I have to buy 3M products so they have jobs). Walking through the end caps we picked up a set of Wooden Dollhouse Kitchen furniture half price for $7.48 which we used the $5 gift card on paying $2.48 for the $14.99 set. We go through a lot of gum--it helps Detamara and Becca concentrate and hold still. Women's leather belts were 75% off, both Becca and Detamara desperately needed these paying $3.74 each. This week Becca, Detamara and I have been busy stocking up on Kelloggs Cereal at Kmart. I had ordered 30 extra coupons Kelloggs coupons the Thursday before Kmart Doubles from ebay for $9.95 and they arrived just in time on Monday. This is Becca and Detamara's Hands on Life Skills Math Lesson for the week... Can you do the Math? 1. It is Kmart Double Coupon Day and we have $1.00 off Kelloggs Cereal coupons. How much does each coupon take off? 2. Kmart had cereal on sale 4 boxes for $10.00. Mom gave each girl four $1.00 off coupons and four boxes of cereal. How Much money did each girl need to pay for their purchase? 3. We ran through the register 8 times in all and bought 4 boxes each time. How many boxes of cereal did we buy? 4. Kmart had cereal on sale for 4 boxes for $10 and we ran through the register 8 times. How much would all of the cereal cost without coupons? How much did Mom save using coupons? 6. The cereal was $2.50 each and we used a $1.00 coupon which doubled. How much was the final cost of each box of cereal? 7. Each box of cereal is $.50 after coupon and Mom bought 32. How much did Mom pay for all 32 boxes of Kelloggs? 8. Becca looked on the boxes and discovered that we can get 2 Free DVD's from buying Corn Flakes, 2 Free Addidas Tshirts from buying Smacks and Corn Pops and 2 Free Disney Disposable Cameras from buying Rice Krispies. How many items did we get for Free using the tokens and offers on the boxes? 9. Mom will submit for $5.00 Kmart Gift Card for buying 4 Kelloggs Cereal with each of the receipts. How many Gift Cards will be sent to our house and our siblings houses? 10. Mom will send in the 8 receipts and to get the $5.00 Kmart Gift Cards. How many dollars in Kmart Gift Cards will we all get for spending $16.00 for 32 boxes of cereal? What should we do some of the extra cereal? Donate it to the food shelves. The CSM had to authorize my transaction as it was so many of the same coupon, and she did it with a smile. Rebates to get pack $20.00 for Becca's and Kasja's Movie Purchases. Last fall they had another $2.50 coupon and I had 10+ packs, I had just filled up my 80 count Bucket once again remarking to Doc that I was running out of boxes in the storage room. I never thought Finish/Electrosol would do it again. But I was wrong. I run my dishwasher once a day unless we have company, for $25.00 One year, Nineteen Weeks and 2 Days of Dishwasher Detergent :) My coupon friend picked up our extra local papers and got me more added coupons, and gave me all hers as she doesn't have a dishwasher. I paid her $5.00 for the coupons. An 80 count Gel Pack was last time I looked $18.00 at Sams Club. Target had the 20 count Gel packs for $4.29 today FYI. Yesterday Becca and I stopped at the Kwik Trip gas station for a soda and a break. Becca was exhausted from our adventures and I parked my big Sequioa in the handicapped parking place in front of the store. The only other space is parking on the hill and when I park there, Becca cannot get out as the huge door closes on her while she tries to get out, or once she is in she can't shut the door with her tiny arms. She fatigues late in the day and cannot walk far without exhaustion. Back to the story, I got out of the car and was yelled at by some 80+ year old gentlemen saying I had no right to park in the handicap stall! I have handicap plates for a reason, I calmly said my daughter is handicapped (so much for medical privacy) and he still was arguing that I am going to get a ticket, creating quite a scene at the busiest part of the day. He told me that kids aren't allowed to have handicap places. In the meantime, some other people were getting into it and staring. I shut Becca's door and moved my car to avoid anymore harassment. The doctors wife in our tiny town of 4000 doesn't want to make enemies, scenes and just decided the battle was not worth picking. Becca was ANGRY and fuming. She stomped in to the store, she was aggitated and telling me loudly that I shouldn't have moved, that guy is discrimating. The last time this happened was when she was 9 and I refused to move from the handicap stall (Becca was in a wheelchair at the time, hooked up to a feeding pump) and an old couple had parked me in, and called the police to have me ARRESTED because kids can be carried by their parents and don't get to use handicap permits. It was such a scene that the Target Security, Police Department were all involved because I wouldn't move. That time Becca got an apology by the Police and Target manager after the near 45 minute stand-off. The old couple were going to appeal to their State Senator that I was abusing my parking privilege. Maybe I should complain, that I cannot park close many times because the stalls are all full and have to put Becca in a shopping cart (lifting my 74+ 19-year-old into the basket) because someone is illegally parking with the car running in for a few minute run-in-and-out. But I be polite and it is just not worth the battle. Or the two times my window has been smashed to steal Becca's handicap placard (that is why we now have plates too) and use the placard when we are out in other people's cards. I reminded Becca we are not going to let some uninformed person ruin our day. Flipping the negative that I love having her for my sidekick because I usually get the best parking places in the parking lot because I have her. So much for her forgetting, I have an assignment that I get to write a letter to the editor of the newspaper about handicap parking permits. High Chair and Changing Table for $10.00:( I am kicking myself for not being there earlier. But I still scored a find, a WHOLE bag of Bitty Baby Accessories for amazingly fifty cents! I cannot believe how fast my Sidekick Becca can find things, she has an incredible eye for spotting things that I would be interested in. She has paid attention all these years, and she knows what is a deal or not, and the best of the best. Becca found herself a Prada purse for $4. It was a picture perfect day to have an excuse to be out on an 86 degree record-breaking day in rural Wisconsin. Becca didn't want it to end and head home, but to really neither did I. Late April begins the Garage Sale season. I have been saving my loose change all year to use for my bargain finds. I have been stockpiling and with my freezers full, we are eating out of what we have on hand other than milk, eggs, and produce. I have a budget of $100 a week for these next four weeks to shop for clothing and toys for my granddaughters, teen finds for my girls, household items, and my favorite, antiques and furniture that can be refinished or recovered to make something old be next to new again. Two of my friends have preschoolers and they have asked me to look for clothing for them. My friend Lisa has twins and her son has cerebral palsy and it is not easy to get out with the wheelchair and the demands of therapy and working, it is my privilege to be able to help shop for Nick and Sophia. My frugal friend has a daughter called this morning asking me to look for size 5 girl clothing and has to work and has given me a list to what to focus on. My other friend called adding to my list with her 5 adopted children who we moved to Lancaster to retire from Minneapolis and her three grandchildren's needs. At least my friends reimburse me for the purchases. I sold retail children's clothing while my older kids were tiny and worked for an exclusive children's wear retailer and this is my forte. I have almost every size of girls covered from newborn to teen 5's between my three friends, my granddaughters, and my girls. I have to look for only 3 boys, but 12 girls. I love to use my talents to help others, and this way I can enjoy finding the best for those I care about. Besides I get bored out here in the country and need something to do. I will look for vintage items to try my hand at ebay for giggles, now that I have honed my computer and digital skills. Maybe it will help support my bargain hunting budget. I always have my eyes peeled for Legos for Nate, and we are now looking for Duplos for his collection when he has kids. 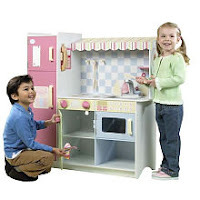 The girls and I collect American Girls items and also dollhouses. Oh yes, I better look for CD's for Doc and watch for something he may like or he will be feeling left out. With assignments and notes in hand, I will head out this afternoon beginning in earnest my garage sale shopping for today. Tomorrow is a citywide in a neighboring small town and later in the day a half dozen or so here in town. Next week is the Lancaster citywide, and the following Friday and Saturday the Platteville citywide (pop 10,000). Last year I implemented that I could not drive out of town for just one sale, I had to maximize the trip to make it worthwhile. Combining it to running to Walmart or errands to justify the gasoline and my time. I have also found that opening times here mean nothing, they may open whenever... I just have to be there hours early, checking back when they open later in the day, or be up with the farmers as sales open at 7 am. I have had to learn the art of our community on how it all works. But rural prices are amazing compared to the city, but I also can find many vintage finds as they reuse things for generations. A great mix of new and old. Today it is my hobby, my passion but for years it kept my kids well clothed and my kids and daycare stocked with the best of the best learning toys. Stick to a budget. Make sure you have cash, few places will take a check anymore. Be there early for the best finds. Check Newspapers or Craigslist for the ad to find the sales that most meet your needs and mark them first to visit. Make a map, mapquest, and organize the trip to maximize time and gasoline. Use your GPS with finding a certain address saving time and gas driving. Keep a notebook of the addresses that are great sales for the future. If you want something and don't have enough cash, ask the seller to hold it with a small deposit while I run to the ATM. Make sure you get a receipt for the downpayment. If it is early in the sale, sellers usually will not barter on the price. Check back if you think the item is overpriced later in the sale and make an offer. It it is something you want, and are unsure, if you pass it up as it will probably not be there when you return. I tend to kick myself when I do this, I should have just bought it, and if it wasn't quite right, I can resell it later. Keep a list of items that you are looking for. I buy ahead when I find quality kids clothing for frugal prices and keep color coded bins of the next couple of sizes ahead. Know your merchandise and prices, and resale values. Know your kids like for style colors, fabrics and have a needs list to not overbuy. Check out the free boxes for missing pieces of toys, miscellaneous or for treasure finds to occupy your kids while you shop. Inexpensive stuffed animals are much cheaper than expensive dog toys. I have a bag of dime or quarter animals for our mutts to play with watching to not find ones with small pieces that can choke them. I gave my kids a quarter or a dollar for them to practice making their own purchases and learning the art of finding what they want or need. If they spent it in the beginning they had to pass things they "wanted" later learning the lesson of not having money to buy what you find later. Quality repairable items will be very inexpensive and can save even more money. Holey jeans can be cut off and hemmed up for summer shorts. Columbia and Jansport items with broken zippers can be mailed in and repaired for free as they have lifelong guarantees. Newer Fisher Price, Little Tikes, Step 2 Items which parts are missing or broken can be purchased from the company. Be aware of recalls on Children's and Baby Equpment. Not all secondhand items are safe. Sometimes it pays to buy new on cribs, carseats, etc. if you can afford to. Today we celebrated another birthday at our house. There is always a birthday coming up at our house with this big family. This birthday is for Becca's little tiny service dog Morgan. Becca treated Morgan like the Princess she has become. The little "4 plus pound Morkie" ruled all day. She has the Tiny Titan complex, she rules, just like her master. My kids favorite childhood book "Go Dog Go" by PD Eastman and in the book the favorite part was the "Dog Party" Big Dogs and Little Dogs. Well today we had a Dog Party. Bailey, Milo, Holly (Detamara's Old rescued Yellow Lab/Golden Retriever) Mom, Detamara, Becca and Dad. The Cats were even invited. I refuse to buy dog treats except when I get them for under $1 a pack and Morgan will be spoiled by her birthday present from Kmart for 2 bags of Mini Beggin Strips for $.99 each after the $1.00 coupon is doubled. Becca fed her a hot dog for her birthday dinner and Morgan definitely knew that today was her day. To Morgan, Happy Birthday and Thank you for opening the door to Becca to be social in public talking to complete strangers about her dog and helping her with her anxiety at therapy when you exercise in the hospital therapy tub with Becca. The girls and I had just returned from our Kmart Lifeskills math lesson for the day when I was shocked to discover the 30 cereal coupons ordered from Ebay on Friday. That was incredibly fast! Tonight we had to return our Saturday's Redbox Movies. It bothered me that my fall cost me extra money not being able to get them back on time, but we watched the third movie tonight before returning them. Fireproof even caught the attention of the Doc who doesn't usually like these kind of movies. Oh well, my not being able to walk for the evening excused the $3 second day rental fee. Doc dropped me off at Kmart while , rushing to beat the 9:00 deadline with 15 minute to go to return them to Walmart. I hobbled in and grabbed 4 boxes of cereal and while I waited took advantage of finding a few more items matching it to my binder. Savings $62.85 for 21 items. I discovered the Kelloggs cereal Detamara has been eyeing on clearance. High School Musical Kelloggs Cereal has been $1.49 on clearance (originally $3.49 and never on sale). Tonight I was shocked to find that it was now on last ditch clearance for a QUARTER a box. I picked up 6 @ $.25 = $1.50 for SIX Boxes of High School Musical Cereal. ( could have used my Kelloggs $1.00 and gotten them for FREE but decided to pass and just pay the $1.50 and use them on the $2.50 boxes). I spent my Sunday turning my storage room into my own mini superstore. Doc, Detamara, Becca and I spent the entire day organizing my storage/stockpile room with the new white shelving I picked up sheving of weeks ago for half price from Shopko. I now have l0--five shelf bookcases of merchandise. I would not let myself head to Kmart until I got the new shelving up, and everything put away to know what I already have. Last weekend Doc refrosted the older freezer and we organized it. We are now eating out of both freezers until one of them is empty. We will not shop until we get it used up. I will be saving my grocery money for May's citywide garage sales and finding antiques to repair and refinish. At our big house in Michigan, I had an a 12 foot wall of shelving for all my extras. I had missed having a place for everything in our scaled down house in the country. I had not coupon shopped for almost a year and a half, and made a commitment to not waste money by not coupon shopping. I began in earnest returning to my life of frugality in December with the arrival of Walgreens and Kmart Doubles. People always told me that living in a rural area meant sacrificing the great deals of the city. It proved wrong, I can have both the peacefulness of small town living and the big city deals traveling to Dubuque a couple of times a month, and heading to Walgreens and Walmart closer to home l4 miles away. I love price matching at Walmart, it saves me time, money and Walgreens is just down the road. Doc and I will carpool, he will round at the hospital and I will bargain hunt. I can't believe that I got all this for so little or for free. Even with Nate and Stacey filling up the back end of their Saab at Easter my stockpile, it didn't make a dent. It is mind boggling the deals that I have been able to get these past four months with using my $400 a month grocery/household budget and $100 for double events or Walgreens Deals. I figured I could get the usual shampoo, toothpaste, toothbrushes, but all the body wash and groceries SHOCKED this long time frugal mom. With all the new shelving and space I could finally put a couple of huge boxes of merchandise away. I can't believe that in less than four months of scouting the deals. I will be making a run to a home for homeless men in Dubuque to fulfill their wishes for razors, deodorant, toothbrushes and toothpaste. I will pick up shampoo tomorrow for all 13 men. I was so busy working that I tripped and fell hitting the concrete with full force. I will definitely be bruised and sore tomorrow. Thank heaven for a doctor in the house who popped my kneecap back on, and finishing my storage room will have to wait until I move better. My Mini Superstore is impressive, saving money for ourselves (I want to be completely out of debt in the next 8-10 years, save for retirement) and easy for my kids, friends to be able to use and help others. WITH my shelving in place, my coupon binders freshly organized, I will be off to Kmart to see what I will find for next to nothing. *Do you think Doc has enough FREE Pringles? On the top of both of the shelves are his 12 Pringles singles and his 30+ Pringles canisters. I took him shopping at Pamida when the Pringles were on clearance and coupons were doubling. He cannot eat a sandwich without his chips. Plan on picking up an extra paper or two as there are several good coupons coming up this week. I found several sources on line for listing of this weeks coupons and posted that was easiest to follow. Most noteworthy is the $2.50 off Electrosol Dishwasher Detergent. I can't believe they are offering this coupon again. Last time I bought 12 boxes after watching the sales and using the coupons for less than $.50 each. I had enough to last 9 months of dishes and just kept refilling my 80 Count Bucket from Sam's club (which now is up to $18.00). Four Boxes will fill the bucket for $2.00. Saving me $16.00 a bucket which is 80 days of dishes for $2.00:) I had enough to fill it 3 times, now it is time to buy enough for next years dishes. A Full Cup issued a challenge to see how far you can stretch $50 and I thought now that my taxes are done, I could splurge and have some fun. I had not spent any money for 5 days, not even a dime. That is a new record for me. With my $50 in cash in hand, newly redated coupon binders, I headed off to Walmart. Doc and I were on our way to Walmart with coupons in hand and got paged to take out an appendix. I was stuck at Walmart for two hours with Becca and had time match my coupon binders to the shelves of Walmart. Can you believe I found all this for just pennies under $30.00 without using double coupons? Just regular coupons and Walmarts prices. Becca was excited to find that the new Honey-Nut Chex is Gluten-free. I had five $.75 coupons which expire tomorrow, which is $9.00 of my spending. Ad the 12 Starkist Tuna @ $.93 each, I had 4--buy 2 Get One Free coupons took another $8.37. (I need to restock as someone in my house has been hoarding empty tuna packages in their bedroom). 12 Free Kotex using the $1.00 off any Kotex coupons, expiring 4/18, 1 Free DelMonte Fruit, 3 Free Dentek Floss, 2 Free No Nonsense Pantihose for Detamara, along with 3--$.08 Kraft Salad Dressing. 8 Dole Pineapple, 4 Dole Mandarin Oranges, 2 Ketchup, 2 Mustard, 2 Barilla Pasta, 4 Activa Yogurt, 2 Dan Active Drinkables, V8 Fusion, 3 Reeses, Mr. Bubbles, 2 Tropicana Juices. I almost forgot the bag of Lays Potato Chips, Becca's string cheese and sodas we opened while waiting for Doc to take out the appendix which blew my frugality. I still have another $20 left to spend on the challenge tonight at Target. Shipping is $7.99 for the first pair and $1.99 each additional pairs. 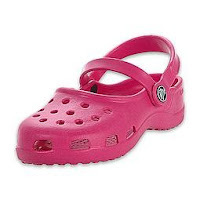 I love the Kids Croc Mary Janes for $4.98 in Black and Bright Pink. Head on over to Kmart.com and find your stores ad for the week of 4-19 and see if you are blessed with double coupons. Our Kmart is doubling here in Platteville, no need to head to the city into Iowa for double deals. What I have found so far for FREE, Sense and Spray Refills (cpn found in box), Vaseline Lotions ($1.25 mfg. cpn). It may be a good time to stock up on cleaning supplies, Pay 50 cent for Natures Source and $1 Windex, Scrubbing Bubbles Bathroom Cleaner. Kelloggs products if you have coupons will be a Great find, cereal and Pop Tarts are 4/$10 . Buy Four and Get a $5 gift card. I will do this deal along with the cereal deal. I will do each as its own transaction to make sure that I get the $5 gift cards. I just became aware that the $5 gift card will be mailed (Oh well, I wanted to use them on my doubles but will just have to send Gift Cards to each of my kids once again to help them stretch their budgets). 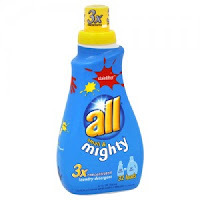 **I just ordered 30 Kelloggs $1.00 coupons on line. I will be heading to Kmart a couple of times for Free Cereal to stock the food shelves. Etoys has a new promotion, spend $25 or more and SAVE $5 on your purchase thru 5-23-09. As many of you have already heard, many Kmart Stores are doubling next week! Our Store in Platteville which seldom doubles will be and I wanted to get a head start on my coupon matchups. Remember that you can double up and including $2 coupons, limit 25 per day, per person. Thank you to Common Sense with Money for posting the Wisconsin list. She has the Doubling Stores posted for several states including IN, KA, CA, OH, WI, TN, IL, MI, GA, SD, KY, FL and NJ. The monthly ad now in progress is now posted at Kmart.com under weekly ads. I have found several good match-ups already. Also from Hip2save.blogspot.com she posted this Kmart coupon good through 5/31 for getting Fisher Price Clothing, Toys etc. Combine it with the clearance and there should be some significant savings on birthdays and christmas, or outdoor toys for the summer. Becca was surprised to learn that her blogging was featured by at SpecialChildren.about.com. To Blog Becca uses a slantboard to elevate her laptop because her neck won't let her look down, she has to sit on her Primo chair to support her aching joints with her short stature, and stretch her hands often as the freeze and lock up. Of course she works in her pajamas for comfort. Becca has picked the winner of the two Disney DVD's. The winner will receive both Disney Bedtime Stories and Tigger & Pooh and A Musical Too DVDs. Becca took advantage of the Target Disney DVD Deals to obtain a set to Giveaway to give a gift to one of her Readers. The Winner is.....Shannon-Soncrazed has claimed her prize and it is being mailed out this week. Thank you all for Visiting Our Blog this past week. Becca was excited to hit 20,000 page views last week, and she was thrilled to have so many people checking out her deals. She was beaming with happiness and a whole week of no migraines and felt valued. To all you bloggers who passed on her deal, Thank you from the bottom of his mom's heart for giving her daughter a moment of incredible happiness. Check back the week of April 23 to find the best deal for Hotel Dogs and her next Giveaway. Target Coupon Match-ups from Attention Target Shoppers for Target 4/12-4/18. This is amazing weekly resource to get the most for your Target Dollar. 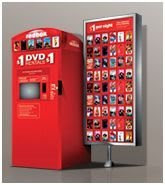 Here is Monday 4/13/09 Redbox Free Movie Code. Use Code: J89LA2 at any Redbox location and get a free movie Rental for today only. Thanks, Jim it takes amazing pictures. Nathan and Stacey were home for Easter. Nate my Legomaniac of course got Legos from the Easter Bunny. This weekend Nate and Becca built Legos, Stacey dyed and styled her hair, we all just "hung out". It was amazing being together. For Becca it is so much more. 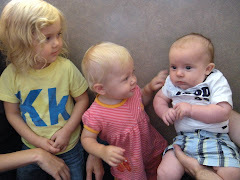 Becca love to be with her siblings. When they leave she is so sad, it hurts all our hearts. She cries for hours. This Mom is tearing up writing this, she just wants to belong, and her siblings Kristy, Nathan, Marissa, Ian, Matt, Deangelo (and in-laws) treat her so well, for who she is, and for a few brief moments she has someone to be with. Thank you Stacey for being an amazing sister-in-law and sharing your sisters with Becca. You give her so much love, time and I thank God for cellphones to ease the loneliness. All Aboard Toys is offering an extra 20% off toys on their entire site when you spend $39 or more thru April 15. Combine the 20% off with their clearance for amazing savings. As always shipping is a frugal $5.95. I started back in March my Walgreens challenge to stretch a $20 bill to limit my Walgreens budget and see just how far it will stretch. Here is my Walgreens $20 Challenge Plan for the week of April 12-18. 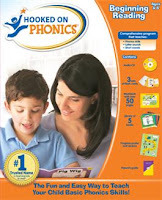 Several of the Hooked on Phonics kits are on sale at the Hooked On Phonics Overstock Store. And even better---Take another 40% off by using the Coupon Code "SAVE40" in the promo/coupon box. Thank you to Bargain Hunting Moms for alerting me to this deal. I priced out the items on overstock after the 40% while I had a calculator handy. These will be $14.97 each shipped. I bought the Hooked on Spanish, Baby Reading Premium, and Beginning Reading all for $50 shipped. To celebrate Webkinz World’s forth anniversary, they announcing a whole weekend of fun, prizes and surprises! Starting on May 1st 2009, the participating retailers have agreed to sell specially-tagged Webkinz Extravaganza pets for just $1 with every $15 purchase from their store, until they run out. Quantities are limited, so visit early! Many stores will also have exciting in-store Webkinz events, activities and contests! It’s going to be a celebration of Webkinz fun! May 2nd and 3rd, 2009. The Lego Store has added new clearance to their store. There are 9 different Duplo Sets from 50-66% off. Lego Duplos are very hard to find on clearance and this is an amazing find. To save even more, sign in through Ebates and get 3% back. 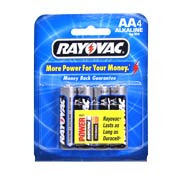 Thank you to the Menards Cashier who patiently rung up our six transactions of 2 each batteries to send out with our Disney Rebates. Our kids appreciate a bonus of $5 in their individual mailboxes :) Plus I almost forgot they will also get the $2 Menards Rebate coupon. We were out of AA batteries and this deal came just in time. If you liked the Bedtime Stories and Tigger & Pooh A Musical Too Post and Giveaway, stop back on April 25 to sign up for my next Movie Deal and Giveaway...Hotel for Dogs. Morgan, Milo and I can't wait to see this movie. Double Heaven--Pamida beginning 4/11 and Kmart Double Rumors for 4/19. I have spent the day getting my coupon binders in order to get ready for my small town Pamida double coupon event starting Saturday 4/11. I took a break from my organizing when I stumbled upon a post on A Full Cup that there are rumors that Kmart may have doubles again beginning April 19th. I will be watching Kmart's site for more news, will my store double? I am hoping for two weeks in a row of double coupons! ToysrUs has a Friday Saturday sale beginning tomorrow. I found the ad in my mailbox this morning. The ad should be posted Friday morning. These specials plus more Friday-Saturday only deals in the ToysRUs four page ad. Redbox code for Wednesday April 8, 2009 expires tonight at Midnight. Apologies from us for posting the $6.00 coupon. It will not print or forward to anyone else. 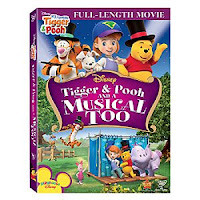 Win a set of Disney Bedtime Stories and Tigger & Pooh and a Musical Too DVDs from Becca's Best Deal Movie Picks. Go Meet Becca my blogging movie and deal writing sidekick. Come back and leave a comment and tell us something you learned out Becca my Tiny Titan. We will draw the winner Easter Sunday at noon central time. Good luck and Happy Easter. More from Becca's Best Deal Movie Pick, the movie deal just keeps getting sweeter. 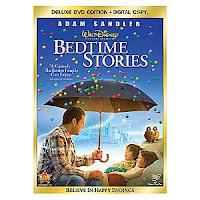 Check out my updated post and print this coupon to save on Disney Bedtime Stories. We watched it last night for Family Movie Night and we loved it, we laughed so hard. Don't forget to head over to Disney Movie Rewards and enter your points toward Disney Merchandize and Movie Tickets. Enter Becca's Giveaway and win Bedtime Stories and Tigger & Pooh a Musical Too DVDs. Check out Becca's post for Bedtime Stories and Tigger and Pooh at Target. You can get both movies for $3.99 after Gift card and Rebate. Bolt for $4.99 after rebates, High School Musical 3 for $3.99 after rebates, and other Disney Movies for $8.99 after rebate.